Call for Proposals for the 22nd Annual Conference of the Society for Disability Studies is now posted and available. Disability Blog Carnival #59 is up NOW! Go, now, check it out--Liz Henry has crafted a fine, fine edition of the Disability Carnival around the theme of "Disability and Work." You'll want to settle in to read it; the contributions are so good, so thoughtful, so rich in ideas and experiences, it's worth savoring. Next month's Disability Blog Carnival (#60!) is due to appear at the excellent new blog, FWD: Feminists with Disabilities in November--date TBA. Because we're skipping the still inaccessible and spam-filled blogcarnival.com system from now on, don't use that form anymore; instead, leave links in comments here, email the FWD blog (they'll give us a preferred email address for submissions when we get the date), or put "disability blog carnival" in the text of your submission, I can usually find those too. UPDATE: Here's the official call for submissions for Disability Blog Carnival #60, to be hosted at FWD on November 19th, with the theme "Disability and Intersectionality." UPDATE #2: Alison Bergblom Johnson will host Disability Blog Carnival #61 at her blog, Writing Mental Illness, on December 13th (she requests submissions by December 4). Her chosen theme, "Telling about Disability." Here's her official call for submissions. Want to host in January? We're looking for hosts willing to put a good bit of work and creativity into the gathering and presentation of the links --it's usually fun, but it's also a commitment. I'll need to know an address for submissions, a date, and a theme (if you have one). Photo above is from today's Library of Congress uploads to Flickr. John Lind (1854-1930) was a teacher and lawyer, the 14th governor of Minnesota, a US Representative, and President Wilson's envoy on Mexican affairs. You can't tell from this photo, but he was also noted for being an amputee--his lower left arm was lost in a sawmill accident when he was thirteen. But Lind was a politician, not a saint, and some other references make that clear. "For a one-armed man John Lind can make some telling blows once in a while," reported the Moose Lake Star on 17 January 1901, and they weren't being metaphorical. 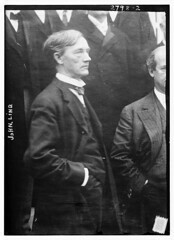 Fresh from his term as Governor, Lind walked into a newspaper office and attacked an editor who had long criticized him. Just trolling around today's birthdays on Wikipedia, spotted Paralympian Katarzyna Rogowiec. She was born on this date in 1977, in Rabka-Zdrój, Poland. At age 3, she lost both hands in an accident with farming equipment (she doesn't remember the event). She's an economist by education and occupation. 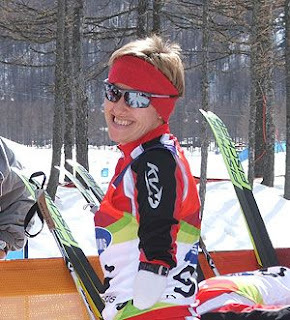 Rogowiec won two gold medals at the 2006 Turin Paralympics, as a cross-country skiier, and she's the current world champion paralympian in the biathlon event as well. Just last week she finished second in the women's cross-country skiing 15km event at the Paralympic Winter World Cup held in Solleftea, Sweden. You have attempted to mold seventeen millions of human souls into one shape, and make them all do one thing. Today marks the 201st anniversary of the birth of Frances Dana Gage, an American reformer, suffragist, and abolitionist. She was born in Ohio, married there, and raised eight children. She presided over a woman's rights convention in 1851 in Akron, where she famously introduced Sojourner Truth as a speaker (the refrain "Ain't I a Woman?" came from Gage's summary of Truth's speech that day). She toured giving lectures on woman's rights and abolition throughout the "old West." 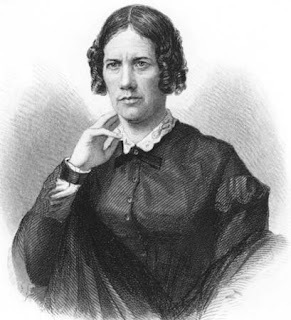 During the Civil War, she worked for the Sanitary Commission, visiting military hospitals and prisons. In 1865, she was in a bad carriage accident and never recovered from her wounds; this was followed by a stroke in 1867. So her post-war work was more in writing and encouraging the movements she held dear. She was also a frequent contributor of fiction to the literary magazines of the day, and wrote children's books, poetry, and novels as well. Gage was a Universalist by lifelong religious affiliation, but "Then came the war, then trouble, then paralysis, and for 14 years I have not listened to a sermon because I am too great a cripple. I have read much, thought much, and feel that life is too precious to be given to doctrines." A statue of Helen Keller was unveiled this week in the US Capitol's Statuary Hall, with great fanfare, because "It’s the first statue in the Capitol showing a person with a disability." Oh? Regular readers of this blog will know that statements like this send me scurrying to check that list twice. I suspected that she was only the first famously-disabled person represented in Statuary Hall, because disability just isn't that rare. The difficulty of naming a definite "first" also reflects the very fluid nature of disability as a social category. But even that iffy "famous for being disabled, like really disabled" distinction isn't quite true. Father Damien (1840-1889), Roman Catholic priest, quite famously contracted leprosy during his mission work on Molokai. Damien's statue, by Marisol Escobar, has been in the Capitol since 1969. The stylized bronze figure shows Damien holding a cane with a gnarled hand, and gives some indication of his facial scarring as well. Hard to call the new Keller statue "the first" if Father Damien and his cane have been there for forty years, isn't it? UPDATE: Wheelie Catholic also wrote about Father Damien this week--seems he's in the news. The editorial committee of Ethnographica Journal of Culture and Disability (EJCD) invites papers from different areas of disability studies informed by culture, though we especially welcome papers which take an ethnographic approach. There are many possible topics, the following being just a small sample: Aging intersecting with gender and ethnicity, public policies in developing and developed countries, disability as a consequence of work environment, (bio-)technology, transborder and transhuman aspects of disability. Manuscripts submitted to “Ethnographica Journal of Culture and Disability” should not be under simultaneous consideration by any other journal, nor should they have been published elsewhere. The review process takes an average of 5 months. Contact information available at the journal website - link. En Septiembre 2009, La Red Internacional de Cultura y Discapacidad (CADIN) hace su primer llamado a publicación en la revista científica Ethnographica Journal of Culture and Disability (EJCD). El comité editorial de esta revista, invita a someter a revisión a aquellos artículos que deseen ser publicados y que estén relacionados con estudios en discapacidad y cultura, especialmente aquellos que tengan una aproximación etnográfica. Los posibles tópicos pueden ser: la interrelación entre envejecimiento, genero y etnicidad; políticas públicas en países desarrollados y en desarrollo en términos de discapacidad; discapacidad como consecuencia de accidentes laborales; desarrollos biotecnológicos asociados a discapacidad, situaciones limítrofes asociadas a la discapacidad, entre otros. Los manuscritos que sean sometidos a revisión no deberán estar al mismo tiempo bajo revisión en otras revistas científicas o estar ya publicados. El proceso de revisión se estima alrededor de 5 meses. Here are some suggested starting points: What work do you do? How's that going? Do you get paid for it, or is it volunteer work or something you do because you just love it? What blocks you from employment? If you're employed, what could be better? Do you want a paying job, or do you feel you contribute to society just fine without one? If you're a family member, friend or ally of a person with a disability, what thoughts do you have on work and employment? What is the employment situation like for PWD in your country or region ? Ready, set, go! And for more ideas for starters, check out Liz Henry's own "Working Women with Disabilities," posted yesterday at BlogHer.